Marine the Labrador that can sniff out cancer. A new study says that dogs can accurately sniff out the early stages of the terminal disease. Marine sniffed samples at St Sugar Cancer Sniffing Dog Training Center in Minamiboso, Chiba, in Japan. Scientists have found that chemical compounds specific to some cancers could be contained in breath and stool samples, which dogs can detect with a high degree of accuracy. The finding could pave the way for a screening test to pick up signs of the bowel cancer before it has spread around the body. The current NHS screening programme uses a faecal occult blood test, which detects minute amounts of blood in stools - a sign of bowel cancer. But researchers behind the latest study say this only picks up one in 10 cases of early stage bowel cancer. For their research, published in the journal Gut, a Labrador Retriever completed 74 sniff tests. These included samples of exhaled breath and stools obtained from 48 people with bowel cancer and from 258 healthy volunteers who have never had cancer or who had it in the past. These five samples were then randomly and separately placed into five boxes. 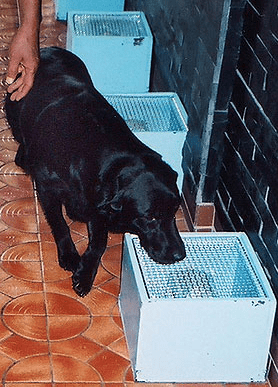 The Labrador, which had been specifically trained in scent detection for cancer, first smelled a breath sample from a patient known to have bowel cancer. The dog then walked along the boxes, sitting down in front of the sample which it believed matched the cancer scent. The Labrador's ability to detect cancer in breath samples was 95 per cent accurate overall, and was 98 per cent accurate for stool samples. The researchers from universities and hospitals in Japan said: "This study shows that a specific cancer scent does indeed exist and that cancer-specific chemical compounds may be circulating throughout the body." For as long as I can remember, you hear about all these advances they have made in cancer treatment and early detection, and yet the death rate from this disorder continues to rise. Will there ever be a viable treatment within the next century? Dogs sniffers are amazing....sniffing out cancers, epileptic episodes, etc. Why would there ever been a viable treatment Doosh? Cancer is big business. So is death. Just ask those funeral directors. Another reason why dogs are awesome!! Just another reason there won't be a cure available. I know a woman whose dog detected her husband's bone cancer in its early stages, saving his life. Nonhuman animals certainly are amazing.